The Lencca Axis is a sophisticated work of art; breaking the norm of traditional laptop carriers to bring you something truly bold and unique. This laptop carrier features a sling design with the look of a messenger bag but the feel and sensory experience of a soft sided bag. The interior stays closed and protected with a fold-over closure and magnetic locking, a zipper is featured on its lateral side and this is where things get interesting. Axis unfolds completely in a 180 degree angle giving you a unique portfolio style interior appointed with card slots, device pockets, document pockets and a zippered pocket. 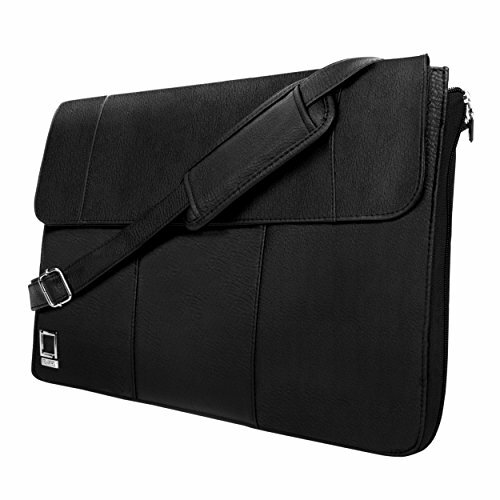 The laptop is cradled in its own dedicated compartment allowing you to use the bag as you see fit. Whether you’re arriving to a meeting and just need the essentials, or a full pledged presentation let Axis be your professional companion.